The NPCC have produced this excellent review of the privacy options available to online users. It includes advice on social media, browsers , apps , smartphones, authentication and security. Click here to open the NPCC Online Safety 2018 Guide in a new window. The Government’s Cyber Aware campaign, which follows advice and technical expertise from the National Cyber Security Centre (NCSC), a part of GCHQ, offers the following simple advice to help you to improve your online security. Remember that spammers could also gain access to a friend’s account, so if you get an uncharacteristic email containing a link from a friend, do not click on it but find another way of contacting them to check that the message is genuine. Leave a website if you feel suspicious – if the site doesn’t look or ‘feel’ right, if there is text that doesn’t appear to have any purpose or doesn’t tie in with the rest of the site, or if you feel uneasy for any reason. Regularly check your social media privacy settings to control exactly what you’re sharing with whom. If you’re going away on holiday, don’t advertise it on social media! If you use a wireless network at home, password-protect it. Email accounts contain more than just your emails. Email accounts contain a wealth of sensitive information. 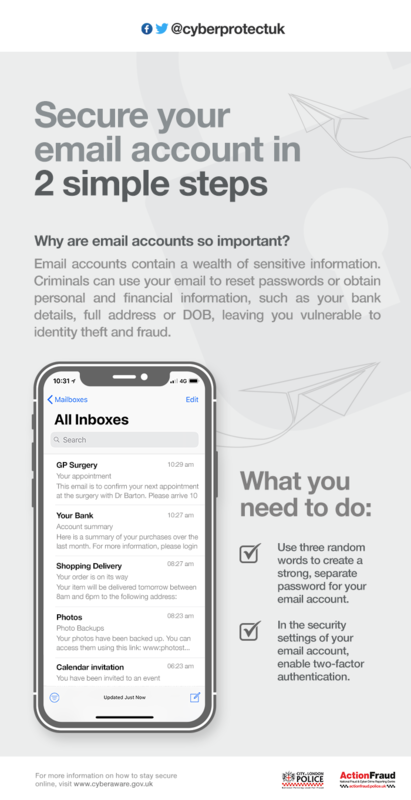 Criminals can use your email to reset passwords or obtain personal and financial information, such as your bank details, full address or DOB, leaving you vulnerable to identity theft and fraud. After terrorist attacks, natural disasters or political unrest scammers will often increase their activities. messages asking for help using emails, text messages or social media posts which seem to be from the victims or their families. fake official emails, text messages, social media posts and phone calls claiming to represent charitable organisations. providing links to traumatic or sensational footage or images connected to the incident which lead to the automatic download of spyware, ransomware or other malware. Do not click on links in unexpected / unsolicited emails, social media posts, instant messages, or texts. Do not click on attachments in unexpected / unsolicited emails. If you get a phone call asaking for donations after an inciden,t regard it as fraudulent and put the phone down. Agree rules about what's ok and what's not. This is the home page of the Meerkats.Why did we choose the Meerkat? The Meerkat belongs to the mongoose family. It is famous for standing upright looking out for eagles and hawks that might attack their community. A Meerkat is always careful. Meerkats work together to keep themselves safe. When a deadly puff adder attacked a burrow the meerkats helped each other and carried all their babies to safety. When they want to be safe, meerkats go to their burrow. Like the meerkat you can learn to be watchful and help to keep yourself safe. Meerkats teach us not to let our guard down and work together to keep our community safe from dangers. We do not live in the wild, but we do have to know about the world around us because sometimes other people, or things we do, can be unsafe. The Meerkat pages will help you to find out how you can help yourself and your friends to stay safe.